The transaction involves $4 billion in cash, $12 billion in stock and $3 billion in restricted stock that vests over several years. The WhatsApp deal is worth more than Facebook raised in its own IPO and underscores the social network's determination to win the market for messaging. Founded by a Ukrainian immigrant who dropped out of college, Jan Koum, and a Stanford alumnus, Brian Acton, WhatsApp is a Silicon Valley startup fairy tale, rocketing to 450 million users in five years and adding another million daily. "No one in the history of the world has ever done something like this," Facebook Chief Executive Mark Zuckerberg said on a conference call on Wednesday. Zuckerberg, who famously closed a $1 billion deal to buy photo-sharing service Instagram over a weekend in mid-2012, revealed on Wednesday that he proposed the tie-up over dinner with CEO Koum just 10 days earlier, on the night of February 9. WhatsApp was the leader among a wave of smartphone-based messaging apps that are now sweeping across North America, Asia and Europe. Although WhatsApp has adhered strictly to its core functionality of mimicking texting, other apps, such as Line in Japan or Tencent Holdings Ltd's WeChat, offer games or even e-commerce on top of their popular messaging features. The deal provides Facebook entree to new users, including teens who eschew the mainstream social networks but prefer WhatsApp and rivals, which have exploded in size as private messaging takes off. How the service will pay for itself is not yet clear. Zuckerberg and Koum on the conference call did not say how the company would make money beyond a $1 annual fee, which is not charged for the first year. "The right strategy is to continue to focus on growth and product," Zuckerberg said. Zuckerberg and Koum said that WhatsApp will continue to operate independently, and promised to continue its policy of no advertising. Even so, many balked at the price tag. 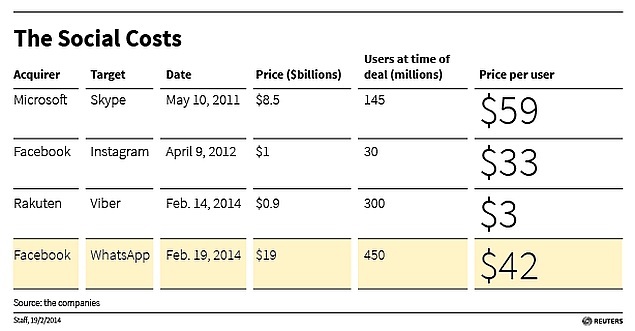 Facebook is paying $42 per user with the deal, dwarfing its own $33 per user cost of acquiring Instagram. By comparison, Japanese e-commerce giant Rakuten just bought messaging service Viber for $3 per user, in a $900 million deal. Rick Summer, an analyst with Morningstar, warned that while investors may welcome the addition of such a high-growth asset, it may point to an inherent weakness in the social networking company that has seen growth slow in recent quarters. "This is a tacit admission that Facebook can't do things that other networks are doing," he said, pointing to the fact that Facebook had photo-sharing and messaging before it bought Instagram and WhatsApp. "They can't replicate what other companies are doing so they go out and buy them. That's not all together encouraging necessarily and I think deals like these won't be the last one and that is something for investors to consider." Venture capitalist Sequoia Capital, which invested in WhatsApp in February 2011 and led three rounds of financing altogether, holds a stake worth roughly $3 billion of the $19 billion valuation, according to people familiar with the matter. "Goodness gracious, it's a good deal for WhatsApp," said Teo, the early investor in Snapchat. Facebook pledged a break-up fee of $1 billion in cash and $1 billion in stock if the deal falls through. Shares in Facebook slid 2.5 percent to $66.36 after hours, from a close of $68.06 on the Nasdaq. "No matter how you look at it this is an expensive deal and a very big bet and very big bets either work out or they perform quite poorly," Summer said. "Given the relative size, the enterprise valuations this is a very significant deal and it may not be the last one."